We’re receiving a lot of requests via Twitter and email, asking how to request secure cycle parking in your road, so thought we better create a ‘How to’ guide! Grand opening of the Warwick Gardens Bikehangar – the first in Haringey. There was a waiting list for spaces within a week. Good question. They’re actually called ‘The Lambeth Bikehangar’ but don’t let that put you off – they can live in Haringey too, and some already do! More info via Cyclehoop, who supply and install the units: Bikehangar is an award-winning popular design for outdoor sites offering a safe and effective way to protect bikes from tough weather conditions and vandalism where storage space is limited. The gas assisted door makes accessing your bike simple, reducing effort when opening the hangar. Furthermore, the galvanized steel frame acts to protect your bike from the elements as well as theft. It is an effective street de-cluttering design which can store up to six bicycles and only occupies half a parking space. 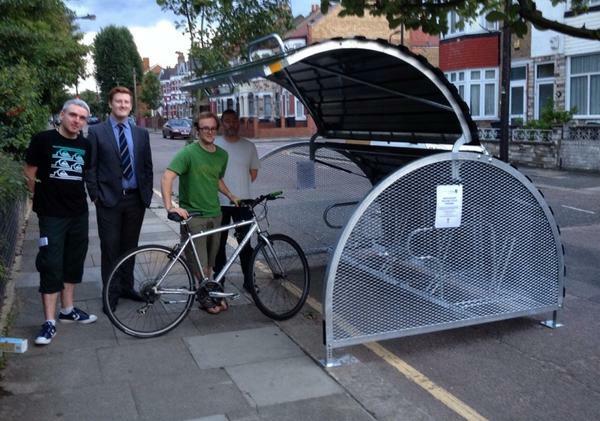 The Lambeth Bikehangar is very popular with councils, who can purchase it and rent out cycle parking spaces to local residents. 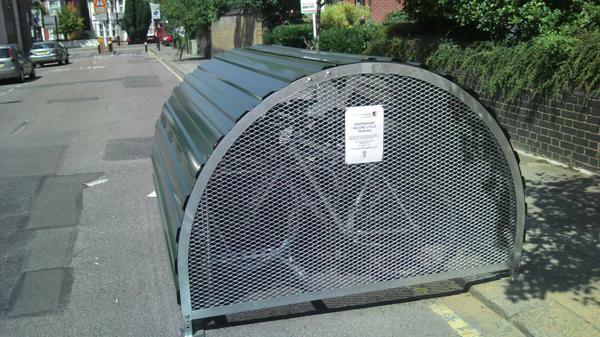 If you are a resident interested in renting a space in a Lambeth Bikehangar, please search for the one closest to you or request one to be installed on your road here. Find out more on the Cyclehoop website. Where are they in Haringey? As of April 2018, there are now 54 Bikehangars installed in the borough of Haringey. Full details of locations can be found on Cyclehoop’s website. How do I request one for where I live? You could also suggest a location, by filling in the form on the Cyclehoop website. Cyclehoop will give a report to Haringey Council and a map of the requested locations. 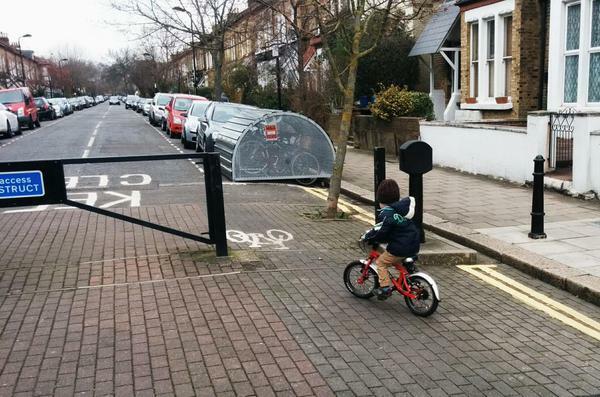 Here’s a fine example of a modal filter and Bikehangar just over the border in Hackney on Finsbury Park Road. Want to request a location for a sheffield stand? Email cycle.parking@haringey.gov.uk (expect an autoreply). Try to include a photo or Streetview link of where you would like the stand, and state why you think one (or more) should be installed.